When students talk about food with third-grade teacher Karen Rath, they mention beets, cilantro and parsnips and explain how things grow. To test their knowledge, they walk out to the schoolyard garden. To test their tastebuds, they take a bite. Now closing in on its final harvest this fall, the four raised garden beds have been plucked of pumpkins and the once brilliant sunflowers are crispy with seeds, but there’s lots of learning still taking place. Carrots and turnips are still growing. And herbs are flourishing, students discovered, as they tasted cilantro and parsley. 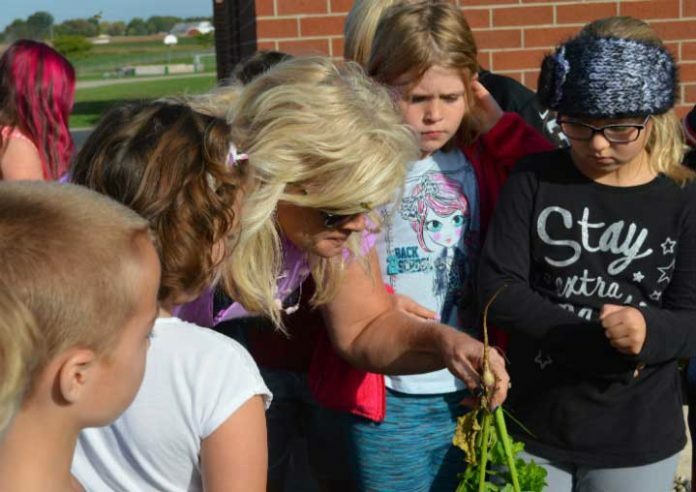 Third-grader Makayla Halblaub nibbled a tiny carrot she had just pulled from the soil. “I just ate a little bit, and it tastes good,” she said. The school’s Boy Scout troop built the garden beds last school year. Angela Rushlow, whose daughter, Lydia, is a fifth-grader, applied for a grant through Caledonia Kiwanis Club, received donations from local businesses and led efforts to have families adopt the garden. Studying Paris Ridge Elementary School’s gardens is time spent in discovery, hunting down just the right piece of produce. The project has endless ties to the curriculum in science, reading, writing and math, Rath said, and is a great way to incorporate the new Next Generation Science Standards. The set of teaching guidelines for kindergarten through 12th graders, outlined in “A Framework for K-12 Science Education,” was adopted by the Michigan Department of Education last November. 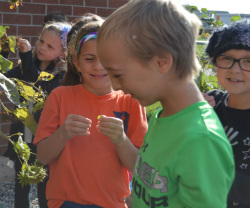 Kindergarten through fifth-grade classes have looked to the garden for many science activities, from describing plant and animal habitats in kindergarten to predicting weather using various sources for planning when to water in fifth grade. In Rath’s class students are learning about the life cycle and doing a comparison between animals and plants. 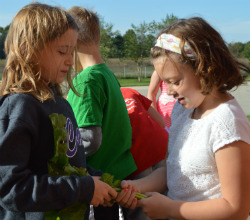 “It’s fun because it’s interesting to look at how much stuff is growing,” said third-grader Libby Coles. Rath has also used the garden for reading and writing, with Caledonia High School students involved in Future Farmers of America donating books about gardening, plant life cycle and where food comes from. For a journal entry, students pretended to be radishes in their writing. “Anytime you can experience hands-on learning, it’s the perfect match for learning and remembering curriculum,” Rath said. Last spring, each grade level chose a different vegetable to plant, water, observe, harvest and eat: lettuce, radishes, bok choy and spinach. Future plans for the garden include composting, having a community dinner and using a rain barrel for water.